Julep Jessica is a pale baby blue and Lippmann Today Was a Fairytale is an icy, blue-silver hex glitter top coat. While I was applying this mani, I was kind of chuckling to myself because most days with an autistic child aren't fairytales. At least they weren't for us a year ago. If you have read my blog for any length of time, you may remember that Blake's diagnosis was a long time coming and something that we struggled with for months. Once we had the diagnosis, while we were thankful that we finally had an official diagnosis on paper, we also felt like a part of us, and our dreams for our child, had died. We grieved for months. Then in August, he started at a new school, in a class made up of only boys on the autism spectrum and it's like we have a new child. He is so incredibly smart and talented and I am finally able to see that. Yes, we do have days that are fueled by his disability, and yes, there are days where I still want to run and hide, but there are also wonderful, amazing days that I finally feel like I am able to see my son and not just his autism. In addition to the month of April being Autism Awareness Month, more specifically, today is World Autism Awareness Day. Today, individuals and businesses the world over are participating in "Light it Up Blue" to Shine a Light on Autism. I encourage you to participate as well, both today and during the month of April. For more information on "Light it Up Blue" and Autism Awareness, please check out lightitupblue.org and autismspeaks.org. Additionally, you are more than welcome to participate in my "30 Days of Blues". If you have a blog, and you would like to join me in any way, please let me know your blog URL and I will be happy to post your blog in my sidebar. If you do not have a blog and you would still like to participate, let me know and I will be glad to post your blue manicures on my site. I will also be happy to post your stories with autism during this month. As you can tell, this is so important to me. I would love to share this with as many people as possible. 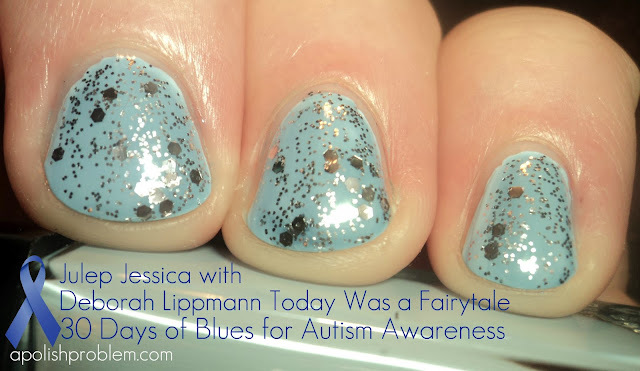 Furthermore, I know I'm not the only nail polish blog participating in Autism Awareness. I know that Jasmine at Colour Coated and Cristina at Let Them Have Polish have also posted blue manicures today for World Autism Awareness Day. I will be adding these blogs and others to my sidebar. All of this is so familiar! I've been on the same road for 6 years now. Oh the stories I have to tell! I would love to chat with you over email! It's rare to find other parents of kids on the specrum like this, and it sounds like we share a lot of the same feelings/struggles/triumphs. I'll be posting my first blue mani tonight. And I'm very excited to join you in this! You rock! Fantastic, Kimber. I saw your responses in my first post and I meant to respond, but then I ran out of time before I had to go pick up the girl child from Kindergarten. I will definitely add you to my sidebar once I compile the list. I can't wait to see your first blue manicure. I will be sure to check your site tonight. We've had a diagnosis for a year, but he's been in the special education system for 3 years now. I feel like that is a continual struggle. We now have him in a good place that finally understands his IEP, but dang... it was rough getting here. Also, my oldest nephew, Matthew, has Asperger's. He is 9 and was just diagnosed last year. We are also seeing many parallels between him and Blake's twin sister, Amelia. So many that we now have her on Intuniv and we have a new patient appointment with Blake and Matthew's psychologist for an eval. I would love to chat with you over email. You can reach me at apolishproblem@gmail.com. Consider your one person reached :) It is so easy to be judgmental and to think "MY parents would have NEVER let me get away with that," but again, as in so many instances, I should not judge until I've walked a mile in that person's shoes. Thanks for the enlightenment. I put my baby nail blog on hiatus yesterday so I can teach myself better photography, but maybe I'll rescind that. Besides, practice makes prfect (or slight improvement, even...) :) I will send you an email if I do. It's a wild ride, that's for sure! I can't tell you how much of a nightmare the school system has been here. Just last week I gave up, and went to the school board and school police about bullying. I'll tell you more in email, and I'm sure I'll post about it, but let's just say that no child should ever go through what Kalli has, and no parent should ever have to fight as hard as I have. I swear, if more people knew about Autism, this would never have gotten to this point. I'm glad Blake is in a place where they understand his needs. It really helps when people know what kids on the spectrum need, and actually pay attention to their IEP's, since ever single one is different! I'm anxious to see what the psychologist says about Amelia! I am not a parent, but I work as a teacher's aide and the majority of my experience has been with autistic children. I really wish more people were exposed to this issue, autism is such a challenging condition and one of the things you most need as a parent is support and understanding from others. The human brain is a very special and mysterious thing, my father has been deteriorating from Alzheimers disease in the last year and it's amazing how much he reminds me of my autistic students sometimes. Autism awareness is of particular importance to me because of this, so definitely count me in on 30 days of blue polish! I am so in! Here's my blog: www.alyloveslacquer.blogspot.com My little cousin has autism, so this is a cause near and dear to my heart! <3 Your post is awesome! Thanks for helping to raise awareness!